French 18th-century red morocco with Roxburge arms on both covers, added ca. 1800; lettered: Roman du San Graal - MSS pret du Xve siècle. Duc de la Vallière sale (Paris, 1784, no. 3994) to De Bure for Count de MacCarthy (not traced in his sales of duplicates); Duke of Roxburghe sale (London, 1812, no. 6092) to Richard Heber; his sale (London, 1836, XI no. 1490) to Techener (Bull. du bibliophile, II, 2, 1836, no. 141 and V, 1842, no. 588); Joseph Barrois Collection (no. 35); the Earl of Ashburnham (purchased from Barrois in 1849); his sale (London, 1901, no. 536) to Quaritch; Théophile Belin (catalogue, 1902, no. 3, facsimiles); purchased by J. Pierpont Morgan (1837-1913) before 1913; J.P. Morgan (1867-1943). 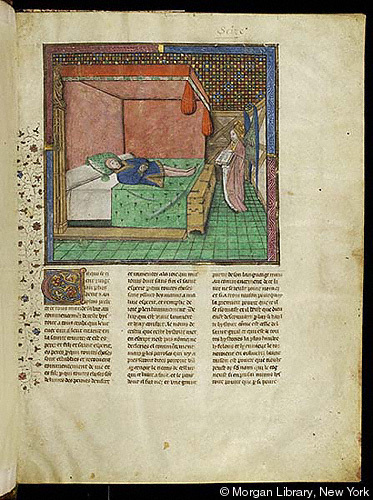 Ms. Roman du Saint Graal et de Merlin, 2 v.; written and illuminated in France, ca. 1450. Decoration: v. 1: 3 large, 12 small miniatures; v. 2: 7 large, 10 small miniatures.